Many a guest who comes along on the Taste Trails Rome Cookery holidays wants to stay on for a few more days and Sabina is ideally placed situated just N of Rome and from here and as a splendid alternative to staying longer at Santo Pietro ( of course you are very welcome and many guests do just that ) or Rome, is Umbria. 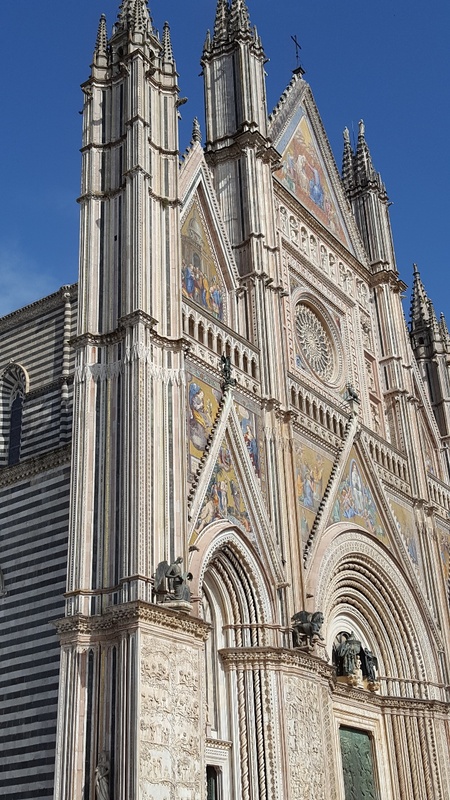 Only one hour north of Sabina and south of Tuscany there are many beautiful places , Orvieto , Viterbo, Etruscan villages, vineyards and thermal springs. The following are some of our favourite places and whether you are a solo traveller or with us for a couples cookery holiday, a few days added to our long weekend or the week long cookery holidays makes a lovely combination and a fine holiday. If Sabina is Extra virgin olive oil then Orvieto is most definitely Wine. With both our long weekend and week long cookery holidays we do visit Orvieto ( it's a special place and so close ) for the day and we visit the Custodi vineyard for a wine tasting and see the facilities but all around you will find vineyards and the fact that historic Orvieto is a stunning hilltop town makes this a go to destination. Lake Bolsena, largest of the three volcanic lakes N of Rome, Bolsena is charming with its centro storico and Collegiata di Santa Cristina church, which dates back to the 11th century. The little hamlet of Marta on the southern shore is also worth a visit, but best of all is Isola Bisentina, a tiny island reached by ferry from Bolsena, Marta or Capodimonte. With seven oratories in various states of disrepair and an artfully gothic landscape cared for by present owner Prince Giovanni del Drago, it's a fine place for a swim or a picnic. Just along from the Custodi vineyard and heading to Bolsena in the tiny village of Porano and in the centro storico you will find a gem of restaurant , Il Boccone del Prete. There is fine food to be had here and without doubt the bistecca Chianina ( T bone steak ) cooked on the stone is the dish to go for. The restaurant is made up of a series of Etruscan grottos and has a fine wine cellar of more than 300 different labels. 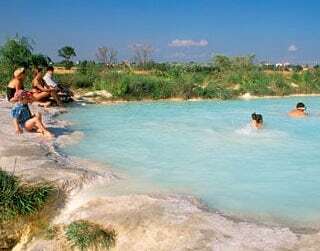 One of the joys of the volcanic northern reaches of Lazio are the hot springs, perfect for a restorative wallow. Many rise in open countryside and attract a mix of locals (who see free thermal pools as a basic human right) and adventurous travellers. One of the best is Il Bagnaccio, where pools have been carved out of white clay in a bucolic landscape that probably haven't changed much since Etruscan times. The reality is all of these places are easily accessible whilst staying at Santo Pietro and this is what makes Sabina for us, the perfect location. Want to experience for yourself Sabina ,Rome and Orvieto? Well you can with Taste Trails Rome cookery holidays.